There are a number of general parameters you can choose to further optimize your EFTEM maps when you use Gatan Microscopy Suite® (GMS) software. These parameters affect all EFTEM acquisition modalities (e.g., SingleMap, MultiMap) and you can locate them in the EFTEM Mapping Preferences dialog. falseDuring EFTEM data acquisition involving multiple images (e.g., summed image acquisition or mapping using multiple windows) the sample may drift, resulting in a spatial mismatch between images acquired successively. If not accounted for, this spatial mismatch will introduce artifacts into the final map or image. 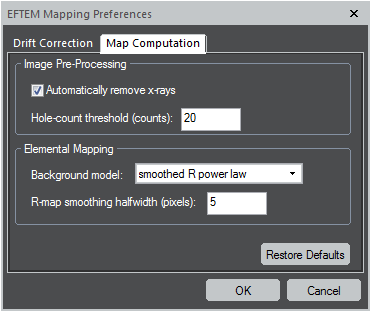 The EFTEM mapping routines have drift correction procedures that you can configure via the Drift Correction tab located in the EFTEM Mapping Preferences dialog. falseThe parameters set here globally affect how you perform map computations. falseWhen MultiMap is present, the Options tab is available. It contains the options which will globally affect all MultiMap acquisitions. falseThe Auto Exposure dialog contains a fast and robust auto-exposure and -binning routine to help simplify the acquisition of elemental maps with optimal image intensity. The behavior of the auto-exposure and -binning routines is dependent on both the preferences you specify as well as on the particular acquisition type. Note: You can use Binning to trade signal-to-noise ratio (SNR) for number of pixels. Fewer pixels (higher binning) gives better SNR, but lower resolution. Typically 2x or 4x is used for edges up to 1 keV and 4x or 8x is used above 1 keV. The EFTEM modes adjust the TEM high voltage to offset the energy during acquisition. This helps ensure the lower column and the GIF remain in focus and aligned throughout the experiment. The other methods of offsetting the energy are used for spectroscopy and are described here. Note: EFTEM at high energy losses is an incoherent imaging process. Conventional bright field TEM imaging is a coherent imaging process and lens defocus is used to add contrast to the image (for example Scherzer focus is typically used for HREM imaging). Incoherent images are only sharp for one value of focus (Gaussian focus). In addition, the large angular distribution of the energy loss electrons results in a very narrow depth of focus. This makes focusing at a reasonable large (~400 eV) energy loss prior to the start of acquisition critical for EFTEM mapping. Since the high voltage offset is used in EFTEM acquisition and the energy of the detected electrons stays fixed, once Gaussian focus is found, the focus does not need to be changed when the energy offset is changed. Berger, A.; Kohl, H. Optimum imaging parameters for elemental mapping in an energy-filtering TEM. Optik. 92:175 – 193. Kothleitner, G.; Hofer F. Optimization of the signal to noise ratio in EFTEM elemental maps with regard to different ionization edge types. Micron. 29349 – 357; 1998. Why do I see bright and/or dark bands at interfaces? Another cause is the application of excessive smoothing of the power law background exponent. This option is set in the EFTEM Mapping Preferences dialog. Consider reducing the smoothing half width or changing to a straight pixel-by-pixel power law model. The maps can be recalculated using the menu item “EFTEM | Compute elemental maps” without reacquiring the data. I see very sharp, periodic contrast that is not from the sample in bright areas, why? If you see very sharp contrast that is not from the sample in bright areas, you may have saturated the detector in ones of the images. Decrease the detector exposure time and/or the sample illumination, then repeat.